Gov. Okowa's Younger Brother Gives Delta State SSG Dirty Slap? Festus Ovie Agas, the Secretary to State Government (SSG) in Delta, has been allegedly slapped by Mr Tony Okowa, the younger brother to the state Governor, Ifeanyi Okowa. This has reportedly resulted in a serious controversy. According to a report by Daily Post, it was gathered that the governor’s younger brother was said to had last Thursday stormed the office of the SSG over untreated files. But apparently angered by the SSG’s alleged responses that the files were not urgent to him, the junior Okowa in the process allegedly closed in on him (SSG) and slapped him. Eyewitnesses who did not want their names in print told Daily Post that, “Tony Okowa, stormed the office in anger. We were in the office when we heard him shouting on why his files were not treated with the urgency that it required. All attempts for the SSG to explain met a brick wall as both of them were shouting, the next thing we heard was slaps on the face of SSG. If not for our intervention, Tony Okowa would have used chairs and other objects to break his head. We were shocked when we started hearing the heated argument from the SSG’s office. Thank God we moved into the office”. But the Executive Assistant to the Governor on Communications, Barr. Fred Oghenesivbe in a swift reaction, denied the incident, adding: “It is certainly not true that the SSG, Agas fought with Tony Okowa, that was a complete falsehood and a black propaganda”. 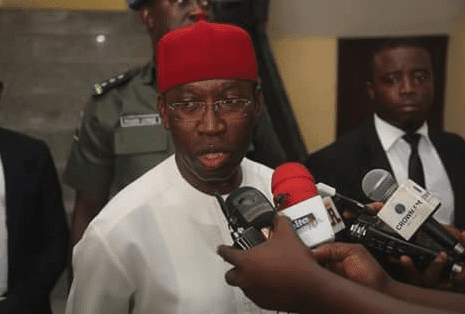 But speaking to Daily Post, Tony Okowa said: “I went to see the SSG actually over some official matters, and he asked me to wait, but I over waited. Frankly speaking, I was not happy for waiting for so long, and didn’t get to fix the pressing official matter that took me to his office, I expressed my displeasure, and I left the SSG’s office, I expected a better reception, and attention which was not forthcoming, that is all I can say”. Efforts to speak with the SSG, Mr Festus Ovie Agas proved abortive as repeated calls to him were not picked while SMS sent to his telephone line was also ignored.